Clive Staples Lewis (he always preferred to be known as "Jack") was born in Belfast on the 29th November 1898. He was raised as an Anglican but became an atheist while a teenager. His education at Oxford was interrupted by the First World War and he was wounded in action during the final German Offensive in 1918. Having recovered he returned to Oxford to read philosophy and English Literature. After nearly thirty years as a fellow of Magdalene College he left Oxford in 1954 for the newly created chair of Medieval and Rennaiscance English at Cambridge. Spiritually he moved slowly from atheism through Yeatsian romanticism to theism, finally returning to the Church of England in 1929 (see Surprised by Joy, 1955). For most of his life a convinced bachelor he married Joy Davidman Gresham, an American Jewish Christian Convert, when she was critically ill with cancer (she died in 1960). He died on Friday 22nd November 1963 at his home, the Kilns, near Headington, Oxford on the same day as the deaths of John F. Kennedy and Aldous Huxley. George MacDonald was at his best as a myth-maker and it was the quality of cheerfulness in his work that captured Lewis's imagination and convinced him that real righteousness was not dull. It was on the 4th March 1916 that he purchased and read the Everyman edition of MacDonald's Phantastes. Lewis was at the time an atheist who found the darker paths of Romanticism deeply attractive. It was his discovery of Phantastes that was to lead him away from these dangerous by-ways and into the clear sunlight. A light that was to find full expression in his subsequent, imaginative, writings. As he was later to write in his preface to George MacDonald: An Anthology, "Now Phantastes . . . had about it a sort of cool, morning innocence ... What it actually did to me was to convert, even to baptise ... my imagination." He further describes this experience in Ch.XI of Surprised by Joy, and in Ch.XII he wrote, "I saw the bright shadow coming out of the book into the real world and resting there, transforming all common things and yet itself unchanged. Or, more accurately, I saw the common things drawn into the bright shadow." If Dante had Virgil as a guide in his The Divine Comedy, then MacDonald is Lewis's in Ch.IX of The Great Divorce. The Lewis character asks MacDonald various questions about the final fate of those who are in Hell and Purgatory, and in the process gives expression to Lewis's own speculative thoughts on these matters. Central to this discussion is the importance of human free will. God will not override our free choices. There is a sense in which Hell is of our own making (though the consequences are for eternity). Lewis appreciated MacDonald not so much as a writer of great literature, than as a Christian teacher. His wisdom and holiness would often triumph over the difficulties of his style. His particular genius was in a form of fantasy that "hovers between the allegorical and the mythopoeic." Lewis regarded MacDonald was the greatest writer of this kind that he knew. It was in this mythopoeic art that MacDonald excelled and for Lewis the great works were Phantastes, the Curdie books, The Golden Key, The Wise Woman and Lilith. "Few of his novels are good and none is very good", but in almost every one it was possible to find something to admire, such as the character of the hero in Sir Gibbie or the opening chapters of Wilfred Cumbermede. Although a poor novelist MacDonald "is a supreme preacher," and Lewis in particular was willing to acknowledge his great debt to the Unspoken Sermons. He especially enjoyed Annals of a Quiet Neighbourhood, on the front flyleaf of which he carefully worked out the family tree of the descendants of Sir Giles Crowfoot and made notes on the rear flyleaf of those pages on which he found text particularly worthy of comment. Lewis had introduced his friend Arthur Greeves to George MacDonald. Arthur began buying second-hand copies of MacDonald's novels, which he then sent to Lewis to supplement those which Lewis had bought with his then limited income. 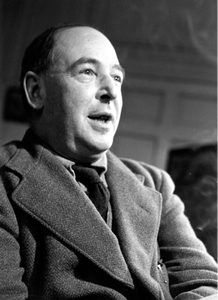 On August 31, 1930, Lewis wrote, "My dear Arthur, I have had two delightful moments since I last wrote. The first was the arrival of the MacDonalds. Thank you over and over again." Lewis then goes on to picture for Arthur the enormous pleasure that the arrival of the parcel of books had given him. Lewis wrote in his preface to George MacDonald: An Anthology, "I have never concealed the fact that I regarded him as my master; indeed I fancy I have never written a book in which I did not quote from him." A typical example is the following taken from An Experiment in Criticism, "The critic is to have the character that George MacDonald attributed to God: "easy to please but hard to satisfy."" Lewis's lively apprehension of evil was balanced by his vision of Joy, which he called "Sehnsucht" - man's longing for his eternal home. He believed that myth could contain universal truth, and that Christianity was the archetypal myth, but one which also had an objective correlative. It was a "true myth."